Healer and multi-instrumentalist Sven Hansen has been conducting these popular workshops here at Creative Therapeutics for years. In addition to an eclectic variety of instruments–chimes, bells, gongs, hang drums, drones (to name a few)–poetry, gentle yoga breathing exercises, and guided imagery might also be employed. Sven uses different musical frequencies to target specific chakras, or energy centers, in the body. Participants may choose to sit in a chair, or on cushions, or to lie on double yoga mats. Get comfortable and let the sounds wash over you, and allow yourself to be transported to a place of deep relaxation and healing. Multi-instrumentalist Bob Macko lends his guitar, flute, and other sonic wizardy to Sven’s percussive array this evening. 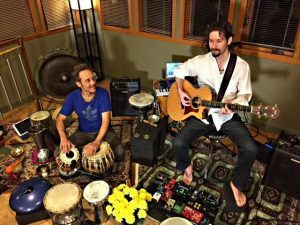 Sven and Bob have performed together for years as the band, MaHaRa, and they create beautiful, otherworldly textures and soundscapes. For one or two people? This entry was posted in Meditation and tagged meditation, sven, sound healing, music. Bookmark the permalink.